Men Who Lose Hair Young At Bigger Risk For Prostate Cancer : Shots - Health News A study found men who reported any kind of balding in their 20s were twice as likely to be in a group being treated for prostate cancer. Men who said they didn't start losing their hair until their 30s or later didn't have a higher risk of the disease. 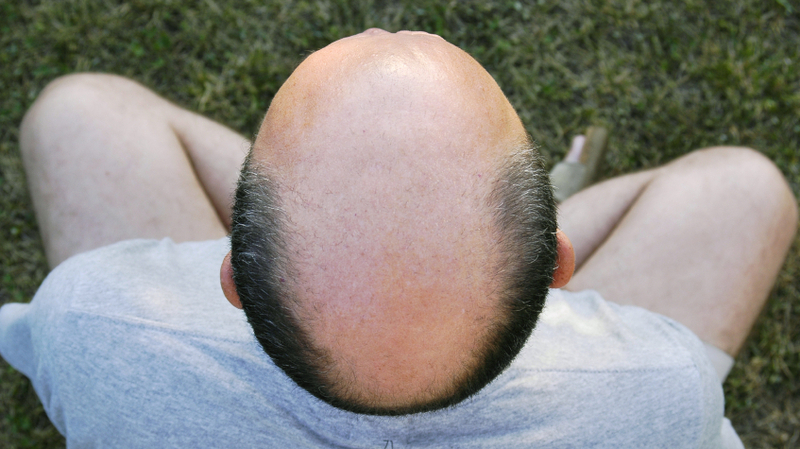 Researchers think early baldness may be a warning sign for prostate cancer. Guys whose hair starts thinning in their 20s are twice as likely to get prostate cancer in their advanced years, French researchers say. The finding makes some sense. In men with a certain set of genes, hair loss is driven by testosterone — and so is prostate cancer. But previous research on the relationship between hair loss and prostate cancer have had conflicting results. The latest study, in the Annals of Oncology, may have come up with the result it did because its authors were able to distinguish between men who started going bald very young and those who had later hair loss. Other studies didn't discriminate between these really premature cases of alopecia and more typical male pattern baldness. About 1 in 4 men have lost some hair by the time they turn 30, and two-thirds by age 60. The French researchers studied 669 men — 388 were being treated for prostate cancer, and 281 had no history of the disease. They showed all of them pictures of different patterns and degrees of hair loss and asked them to choose how their own heads looked at the ages of 20, 30 and 40 — full head of hair, receding hairline, balding crown or both types of balding. The men who reported any kind of balding in their 20s were twice as likely to be in the prostate cancer group. Men who said they didn't start losing their hair until their 30s or later didn't have a higher risk of the disease. There didn't seem to be any relationship between the type of hair loss (frontal, crown or combined) and prostate cancer risk, but that may be because there weren't enough men with significant loss of different types to pick it up. There was no suggestion that men who started to go bald in their 20s were any more likely to get a more aggressive form of prostate cancer. What's the use of this finding? The researchers say there's a great need to figure out which men are at higher risk of prostate cancer so they can be screened more often for rising PSA levels, or perhaps consider taking a drug that can prevent prostate cancer. By the way, if you're wondering how well men in the study could remember what their scalps looked like decades earlier, the French researchers say the picture-matching technique has been validated in other studies. Men are so vain about this kind of thing ("alopecia can impact self-perception" is the way they put it euphemistically) that most men are pretty good at remembering if they started losing their hair at an early age.